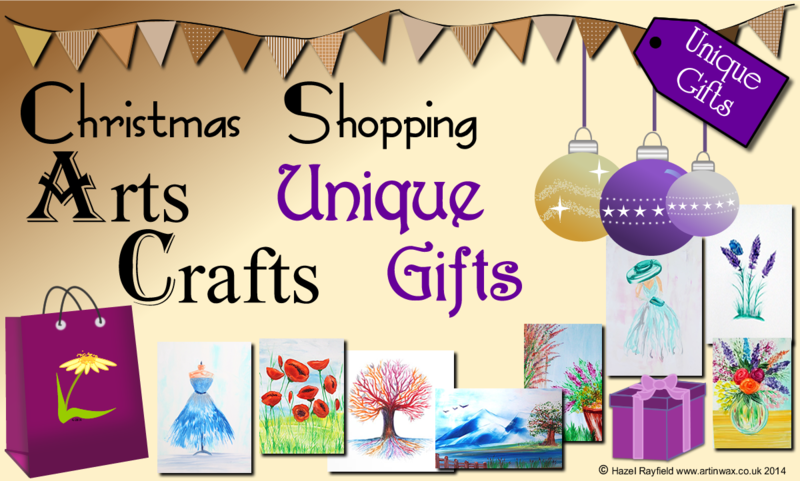 Its that time of year again, Christmas is coming and there are lots of Arts and Crafts fairs, Christmas Market and Handmade events for us to attend in venues across the country. Many church halls, events centres, country house hotels see a varied mix of Artisans and Crafters setting up stalls and stands, bringing out the bunting and tempting us with lots of unique goodies for us to buy as christmas gifts or treats for ourselves in the run up to Christmas. Art In Wax will be at a couple of miniature fairs in the run up to Christmas but for a easy way to buy your gifts why not shop online……. From wall art, mounted ready to frame to smaller pieces that sit on a mini easel or shelf, with no need to frame and no need for lots of wall space to, of course, my range of miniature paintings ideal for dolls houses but also very collectible as miniature art works. Art In Wax has something for everyone …..
Buy Direct on the Art In Wax Website Shop. Art In Wax Etsy Store. There are some wonderful shops online selling handmade arts and crafts. Outlets where people buy direct from the artisan such as UK based Folksy and US based Etsy ( I have stores on both) are very popular. As well as selling I also shop online and have bought some wonderful and unique gifts for friends and family….. and for myself naturally !! I can’t mention them all but Gerda Bags on Etsy is one of my favourites as is Flamehaired Jewellery Folksy shop. I am also part of the art community on folksy where there are many artists painting in many styles and mediums, I will be asking then if they would like to contribute to this blog so watch out in the comments for links to other artists and crafts shops too. So whatever you are looking for as a gift or treat for yourself, why not think about a unique handmade gift or piece of art. It is always nice to give a gift that is special and nowadays there is so much choice when it comes to buying our family, friends and loved ones a present. How about thinking a bit different and giving some original Art. So what about a change from socks and smellies!